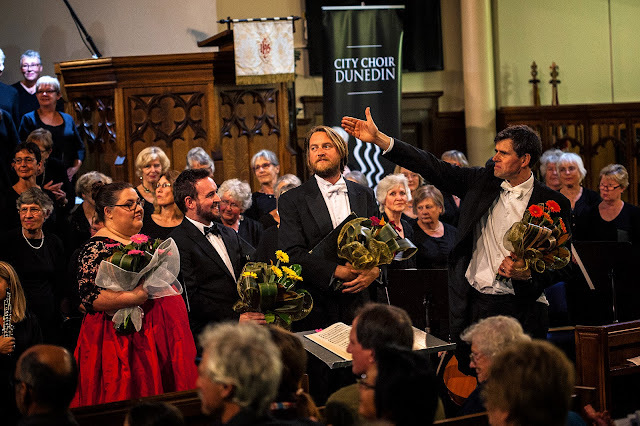 City Choir Dunedin opened their 2018 season on Saturday evening with a varied and engaging programme of music for Easter. Led confidently by music Director David Burchell and accompanied on the organ by Douglas Mews the choir began with Verdi’s setting of Stabat Mater Dolorosa. Beginning perhaps a tad too enthusiastically the choir soon found their voice settling nicely into Verdi’s vivid depictions of the Crucifixion. While in some sections the choir seemed unsure of the specifics of Verdi’s more complex harmonies, in others, particularly some of the more lamentful sections, they achieved a pleasing warmth of tone. Following this the audience was introduced to the guest choir for the evening. The Main Street Singers hail from Los Altos High School in the San Francisco Bay area. The Choir have been doing annual international tours for many years and this year’s brought them to New Zealand and Tonga. Their first bracket contained three works by American composers juxtaposed with a 16th century Madrigal and an African American Spiritual. While their performance of John Bennet’s Weep, O Mine Eyes at times lacked the clarity and confidence demanded by complex renaissance polyphony, their other works were executed sensitively and effectively with the moving Felices Ter by Randall Thompson a particular highlight. Following this the City Choir returned to sing Lo, the Full, Final Sacrifice by Gerald Finzi. For this the choir’s forces were augmented by soloists Benjamin Madden (Tenor) and Malcolm Leitch (Bass) who sang not just the solo roles but in the choir throughout. This was a masterstroke and greatly secured the smaller Tenor and Bass sections of the choir that in turn led to a more confident and well blended sound overall. Finzi’s setting of the text by Richard Crashaw is at times both powerful and sensitive and the choir proved adept at portraying both with the support of Douglas Mews from the Organ. The solos from Madden and Leitch as well as Caroline Burchell (Soprano) from the choir were effective and provided an excellent contrast to the powerful and moving central section of the work. The second half began with a second bracket of songs from the Main Street Singers. This bracket included a similar selection to the first beginning with energetic and contrapuntal Cantus Gloriosus by Josef Swider and ending with two enthusiastically received spirituals. Overall the choir proved themself an impressive group of young singers evidenced both through the high level of proficiency in the singing and the impressive quality of their soloists. Their commitment to contemporary repertoire must also be noted and commended (although the fact that of five original 20th century compositions none were by women must be questioned). The evening was concluded with Bach’s Cantata 66 ‘Erfreut euch, ir Herzen’ for this the City Choir were again joined by Madden and Leitch as well as Claire Barton (Mezzo-soprano) and a small, seven piece chamber ensemble from the Dunedin Symphony Orchestra. The opening chorus was declamatory and effective as the choir implores the audience to “rejoice” at the news of Christ’s resurrection. This was followed by a series of arias which displayed the virtuosity and tone of voice of the three soloists. The DSO ensemble was effective throughout with the pair of oboes dazzling in the opening chorus, a beautiful Violin obligato solo complementing the voices of Barton and Madden in the final aria. The final chorale was a fitting if brief conclusion both to the cantata and the concert. Nathaniel Otley is a third year Music Student at the University of Otago studying Performance Violin and Composition. As a singer Nathaniel has sung in roles for both Opera Otago and Little Box of Operas. He has also sung in choirs including the New Zealand Secondary Students Choir and is a current member of the New Zealand Youth Choir.